Gorgeous Horse, Horse Tales and IAHA to name a few. Barbara Longley, Ringmaster - Jack Dougherty, Scorer IAHA - Connie Curtis, Asst. 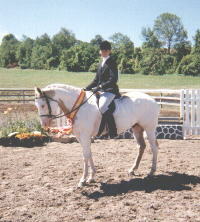 Equine Practice, Videos - Horse Videos, Inc.
Hunter Judge - Annabelle Francia-Kiss (New York). century. Can't hardly believe it's almost here. morning, donuts and bagels were available in the Hospitality Room. On Wednesday Evening the "Welcome Party" was held at the Jukebox Restaurant. "Free" hot dogs and hamburgers to the exhibitors. What a great way to start a show! good food at the show! 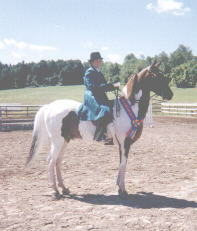 $16,500 Regional prize money was given out to the non-sweepstakes classes. Every Grand Champion received an embroidered cooler. fee for sequential elimination. 2.) Horses qualified this year is good for 2000 only. horse to the Championship in the year 2000. 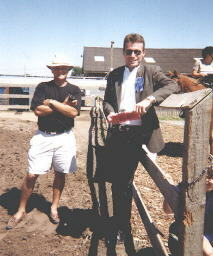 Steve Burkhart and to Tom Matthews (Jensen Stables Head Trainer). him a bag of Treatwell's horse treats for his efforts - thanks Ed that was fun! ringmasters and all-around staff the past 14 years - it has been memorable! laughing throughout the class. 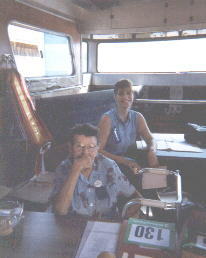 The winner was: Uncle Louie DiGuiseppee on "Ann Marie"
that happen to fly by them. Horseshow a memorable one. We hope to see all of you in the year 2000 at the Classic!